Saturday brought a break in the weather, although temporary. Rain, rain, and yet more rain has been the story of our spring. 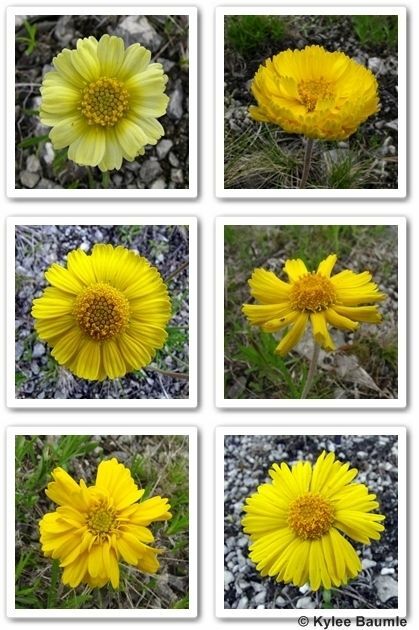 Amid warnings of flash flooding in Ottawa County, Ohio, friend Julie Kroske and I traveled there to see Ohio's rarest wildflower - the Lakeside Daisy (Tetraneuris herbacea, a.k.a. Hymenoxys acaulis var. glabra, and Hymenoxys herbacea). 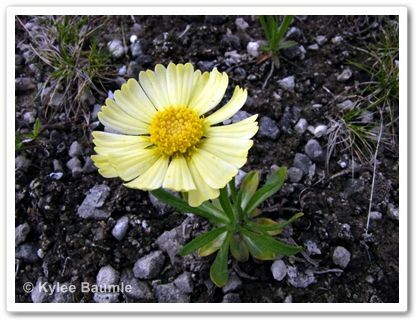 I first heard about the Lakeside Daisy from my niece, Melissa, who works for the Ohio Department of Natural Resources. 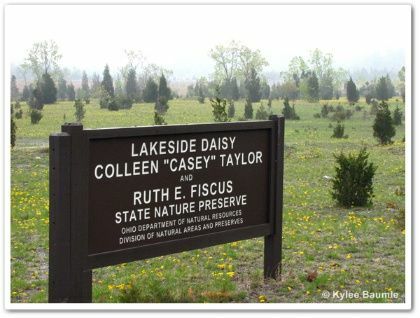 A couple of years ago, she was working on monitoring the population at the Lakeside Daisy (Colleen "Casey" Taylor & Ruth E. Fiscus) State Nature Preserve, one of only four locations where the daisy is found in its natural habitat. The other locations are in Michigan's Upper Peninsula, and two in Ontario, Canada. The location in Ohio is the largest, encompassing 19 acres. As we drove out on Marblehead Peninsula, which juts out into Lake Erie, the ground fog coupled with the sound of ship's horns provided a bit of drama for our adventure. We saw a small sign indicating the direction for us to turn to see the daisies, and we drove out of town, by the LaFarge Quarry on the right. All of a sudden, we looked to our left and I'm sure I gasped as I got chills, because of what I saw. If you didn't know better, you'd think it was a large field of yellow dandelions in bloom. 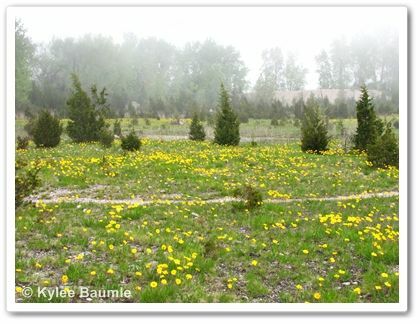 But it was the equally simple beauty of thousands upon thousands of Lakeside Daisies in all their rare glory. We parked the van and walked into the preserve, where we met a lovely group of people from Canada. Several of them were Master Gardeners and they'd come to see the daisies, too. 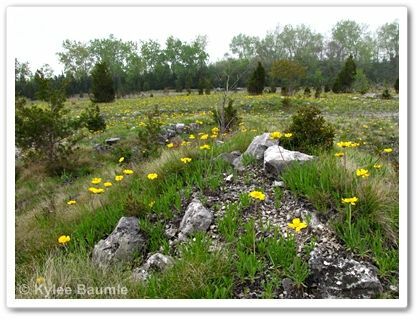 The daisy grows in the unique environment on Marblehead - on an alvar, which is a limestone plain with little or no soil. Try and dig with a shovel in such an area and it's a no go. 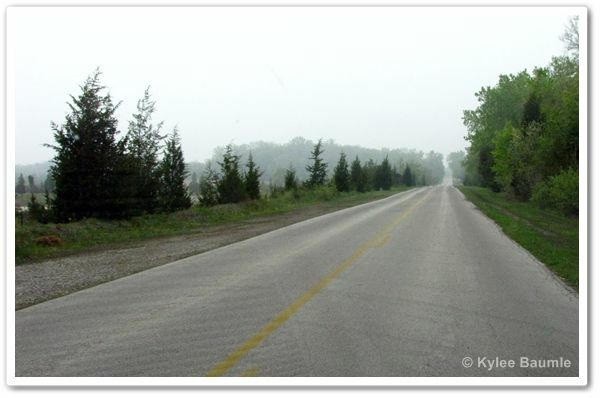 The limestone rock and gravel create a thin, alkaline soil, very much like the shoulder area of our rural roads here where I live, just 2½ hours away. Alvars themselves are somewhat rare in their occurrence. 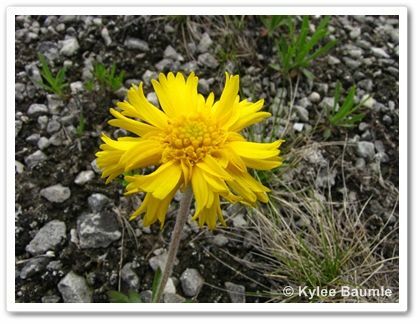 A long-lived perennial that spreads by seed dispersal as well as underground rhizomes, the Lakeside Daisy remains on Ohio's endangered species list and is federally threatened. The preserve is also home to several other rare plants and wildlife. While I don't think these are rare (perhaps they are? 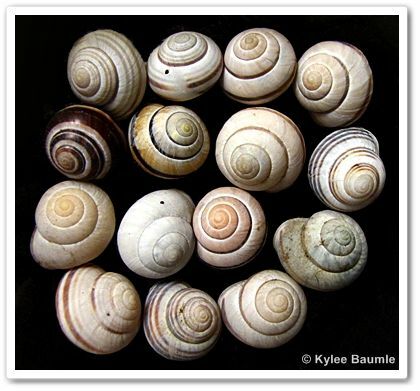 ), we saw thousands of snail shells. Not surprising, given the proximity to Lake Erie, I suppose. Spiked blazingstar (Liatris spicata) is plentiful, too, which makes me think perhaps another visit to the preserve is in order later in the summer, when those are in bloom. It's likely to be a purple vision. A Cabbage White butterfly takes a nectar break. 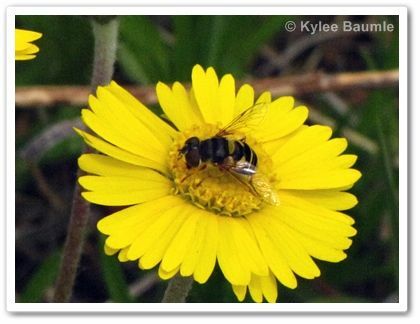 A hoverfly does its pollination thing. Cedar trees are dotted across the landscape and at the back of the preserve is a healthy stand of the invasive Giant Reed Grass (Phragmites australis). 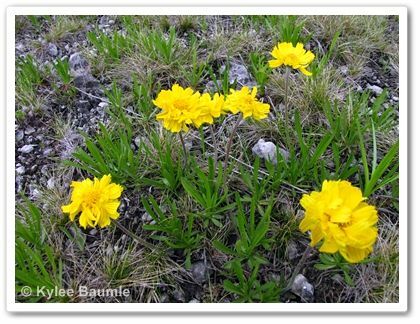 It is encroaching on the preserve and is a threat to the Lakeside Daisy and other rare plants. located at the back of the nature preserve. 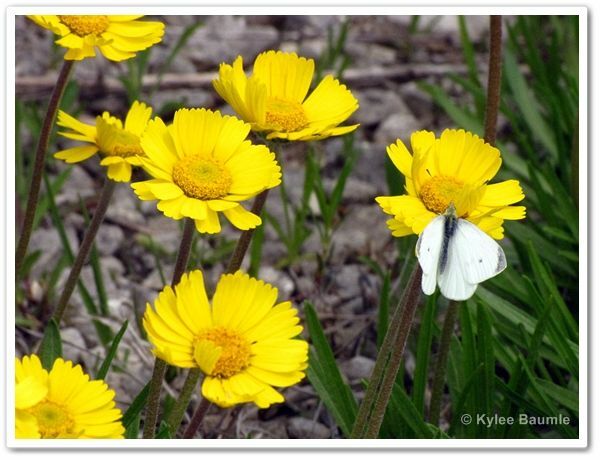 Variations of the blooms of the Lakeside Daisy are quite apparent and common. The most obvious was the pale yellow - some nearly white - and the double and triple ones. There's an eagle's nest nearby and we were told to watch for them flying overhead. 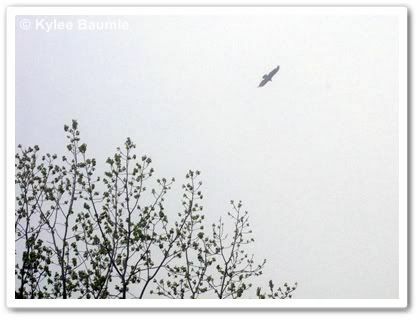 I can't be certain that this bird we saw soaring was an eagle, but it was certainly large enough to be one. 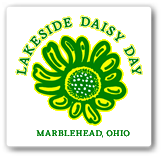 Each year, the Marblehead community holds Lakeside Daisy Day, to celebrate the late April to mid-May blooming of its local treasure. Sounds like a wonderful excursion, Kylee. I love the natural variations in the flower. Nature has fun ringing the changes, doesn't she? 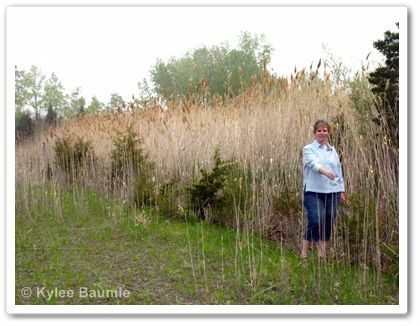 We have a big problem with Phragmites, too. Many people don't know that it's bullying its way into the country's wild, wet spaces – and hasn't been planted on purpose. Bravo! Thanks again for letting me experience this great day with you and the Daises! I had a wonderful time. Can't wait to have more adventures with you and your camera! Sounds like a wonderful field trip! I've never heard of these, Thank you for sharing! 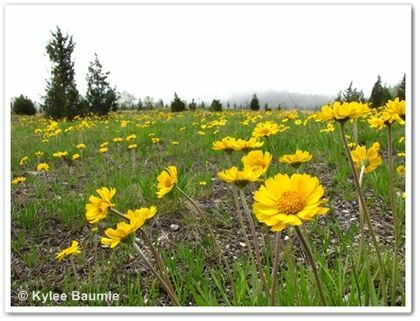 I did not know this about the Lakeside Daisies. They are a pretty flower. I have such fond memories of Marblehead and the Port Clinton area. We use to go several time a summer to go fishing with my Grandpa.He kept a camper up their and they were such fun days for me. David ~ I'm willing to bet that 95% of Ohioans have never heard of this. It was only three years or so ago that I did, and I've lived here for more than 53 years. Lona ~ If I remember correctly, my dad used to go fishing up there, too. His aunt lived in Port Clinton. Mom went to church camp at Lakeside. Annie ~ I agree, Annie! I love learning about these little known treasures! And this time, it happened to be close to my own backyard!